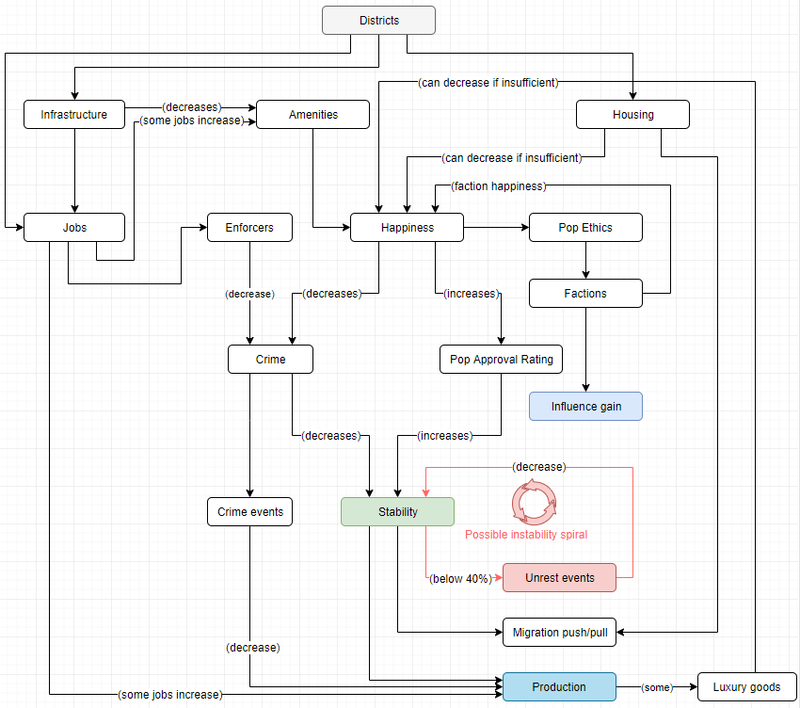 Many of Stellaris’s major patches - version 1.6, 2.0, 2.2 - have been riddled with bugs, glitches, and game-breaking jankiness or oversights that have certainly hurt the reception of the game. But for this conversation, I want to set all of that aside. I want us to pretend that these major updates were released and working as intended without the technical issues that have been levied on the fan base and patient customers. I want to pretend the game is working properly because I want to focus the conversation instead on the changes to the game’s underlying design. When I say that Stellaris is dead, it is not because of bugs and glitches that will - in all likelihood - eventually be fixed. After all, version 1.6 was an utter mess. But by version 1.9 the game was stable and working well. It can happen again. Rather, when I say that Stellaris is dead, it is because - “FOR ME” - the game’s underlying design has gone in a direction that runs counter to both my preferences, but more importantly, against what I felt the initial vision and dream of Stellaris was in the first place. And not just for me, but for a vast swath of the game's early adopters. What was this initial vision, you ask? 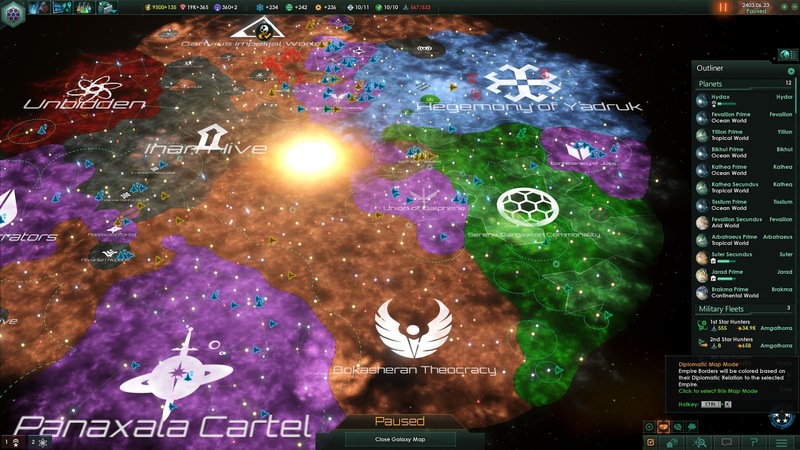 Galaxy spanning empires and beautiful geopolitical messes… in theory. Stellaris was billed as 4X meets Grand Strategy, and is developed by the company that is the undisputed master of grand strategy games (Paradox). My idealized vision of a 4X game is one of empire growth and expansion that feeds into a titillating geopolitical strategic experience. By geopolitics, I’m talking about diplomacy, foreign trade, military deployments, competing ethics and national personalities - you know the stuff that Europa Universalis IV is praised for. I thought, that this is what Stellaris would be. That it would take geopolitical strategy and bolt on the initial empire expansion and exploration hallmarks of 4X gameplay. It would be glorious! When Stellaris launched (again ignoring the bugs and glitches and quality of life lapses in the UI), I felt that I could see the light at the end of the tunnel. Here was a game where you could have a 1,000 stars and dozens of races in all sorts of geopolitical entanglements (Vassals! Subjects! Alliances!). It had an exceptionally refreshing exploration and discovery phase. The warfare system offered up something unique at the strategic level (e.g. accounting for varied types of FTL movement or how federations operated). The game also tackled one of the big questions that has dogged the genre for years: how do you scale up the size of your empire to dozens or hundreds of systems across an entire galaxy without drowning the player in tedious micromanagement? The answer of course is the sector system, which lets you scale up the level of your management to match, so that you don’t have to deal with the individual planets anymore. The sector system frees you up to focus on the grand geopolitical game. At least in theory. In those early days, we could opine about all the things that needed improvement: rebalancing combat mechanics, improving the sector AI so it wasn’t a dunce, adding even more diplomacy options, making leaders more interesting, reworking the internal faction system, adding quality of life features, refining the end-game threats. Maybe even adding a cool ethics based goal or victory system. We got a few of these improvements over the past few years. But we also got a lot of things that undercut, trivialized, or simply did away with them entirely. Whole gameplay systems were replaced with re-designed systems that took the game away from its initial vision (and what compelled me to hold out hope for so long) and turned it into something else entirely. Lordy, take a look at the new, low-micro planetary management model. Let me try to spell it out it as concisely as I can. The changes to Stellaris have taken the game further away from its premise as a grand, highly interactive, geopolitical 4X game and more towards an inwardly focused, optimization-based, low-interactive empire management game. I see a very stark difference between an empire management game (think of city management games) that focuses gameplay around internal decisions and optimizations and a typical 4X or Grand Strategy game where the gameplay is focused around external interactions (warfare, diplomacy, trade, etc.). * Instead of multiple, distinct FLT (faster than light) modes of travel that created a rich strategic landscape, we now just have star lanes with easy to defend choke-points and brain-dead warfare strategy as a consequence (hold the gap!). * Instead of messy territorial boundaries that create weird emergent situations and force strange interactions with foreign empires, we have neatly defined and discrete territories with very little uncertainty or dynamism. * Instead of building a huge empire and being given the tools to manage it at higher level, the game space has been shrunk down. * Instead of a clean and intuitive planetary management system (if a little micro-heavy outside of using sectors), we now have a labyrinthine horror masquerading as planetary “economy” - which incidentally requires even more micro and attention paid to it (see the diagram above). All of this means fewer planets to control and relatively more focus on the internally-oriented optimization gameplay. God help the AI understand this. And overall, instead of a daring game of exploration, expansion, and geopolitics, we’re left with a safe game where we can build our little, tall, turtle empire in the corner and not have to interact with other empires much at all. The AI is clearly broken right now - but I suspect a lot of people are just fine with that - because they don’t want to deal with the AI or other players/empires in the first place. Worst of all, is that so much time and effort was spent reworking existing game systems, which needed tweaking not wholesale replacement, that we’re still waiting for many of things that have been sitting on the wish list since day one. Diplomacy has gotten worse since launch, with whole ideas and mechanics stripped out and replaced with nothing. Sectors were improved - and then their reason to exist was virtually eliminated in version 2.2. Trade was added, albeit through a half-assed global marketplace. Warfare has changed and yet the mechanics around war score vs. war exhaustion feel like they are still going in circles with no clear direction in sight. And of course we’re still waiting for something to spice up the mid- and endgame. A good number of people, perhaps even a majority, are happy with the changes in the game’s design direction (assuming the technical issues are fixed). For many people, it seems their enjoyment of Stellaris is coupled to the narratives they imagine for their empire, which are heightened by the more internally-oriented gameplay systems. So for them, the changes may be seen as a positive. This is, I worry, part of a larger trend in strategy gaming towards less-interactive gameplay systems. So to say the least, I’m not surprised. 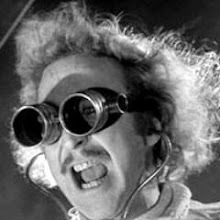 Call me old school, but I want the narratives I create and the stories I can tell to exist on the grander, galactic, geopolitical stage. On the stage that I thought Stellaris was building. That’s my dream for a 4X meets grand strategy game. But increasingly, this dream is a distant and fading memory. I have little faith that Stellaris will be the game to revive this dream. And so I hold out hope that some other game will. Good article, Oliver. Couldn't agree more. It's really sad too, because Stellaris could have been a genre-changing game. Instead it's just a popular game title, which is nothing new or or novel. Thanks man - I appreciate the comment. I know I've been super critical of Stellaris since the early days, and I'm sure people are probably saying "why the hell won't Oliver just get over it move on - clearly the game isn't for you!" That's true to some extent. But for all the faults I find in Stellaris, there is something tantilizing about it's promise and the look and feel of the game. And more than any other game I can point it (except Distant Worlds probably), it held the promise of being what I want to 4X game to be. So I keep harping on it like someone trying to get over a lost love. Well the website somehow ate my entire comment, so I will simply say I agree with your article entirely, Oliver. 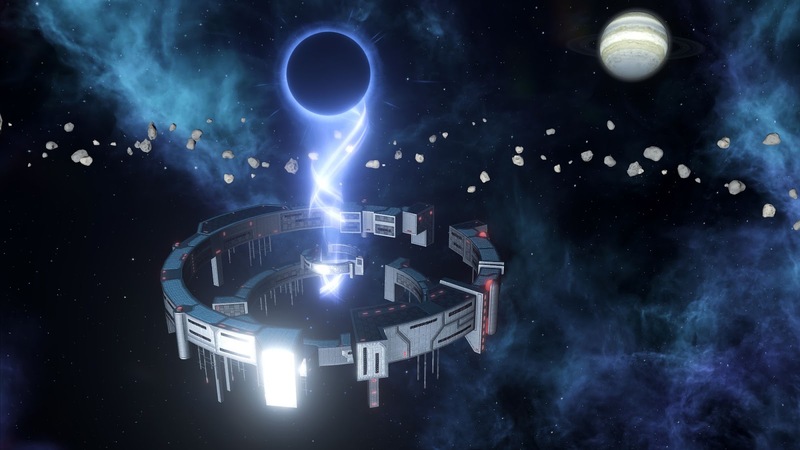 The current version of Stellaris is a mockery of what it once was. When I think about what might have been, I could almost weep. Sorry about your comment getting lost! Cheers. I'm hard pressed to identify a "space" 4X game that really nails it. Distant Worlds is probably the closest - but it's also it's own brand of complexity and UI chunkiness. Endless Space 2 could be good - the systems are all designed in interesting ways - but it really needs a rebalancing and big AI improvement patch to make the interesting choices more impactful. As it is, it's too easy even on high difficulties to steamroll the opposition. Armada 2526 - a game again with it's own flaws - has been the space 4X game over the past decade or so that I personally think has the most interesting design and possibilities. But it also rubs people the wrong way and commits some unforgivable sins in the minds of many (i.e. no ship designer - which I have no problem with) for it to get much traction. City management in, say, CIV, was always a drag for me. I agree 100%. It seemed like I would have to check every city, until I found the one that didn't have an "Tier 2 Minerals Committee Headquarters", then wait until I could afford that building. 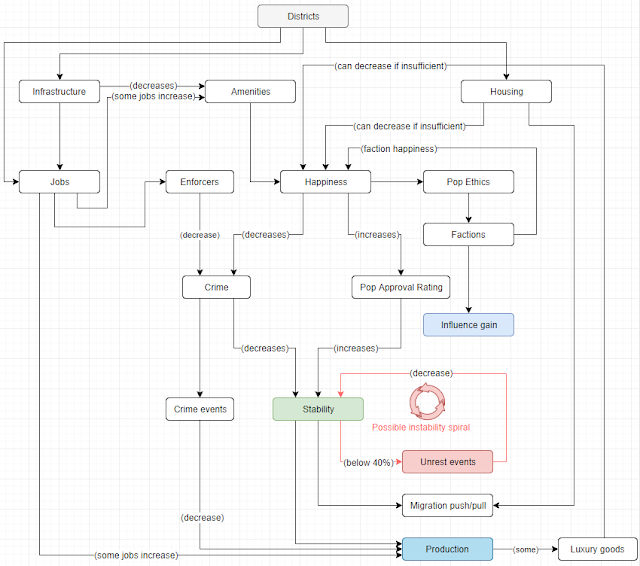 Random Tech trees made the game fun, because you'd have to get creative about composing your armies to fix weaknesses. Random Maps made the game fun, because you'd have to get creative about expanding your empire. In Stellaris, you have to get creative to squeeze any fun out of this thing. Nice article! I see your point of view and agree with you that Stellaris is not the game most of us thought it would be/could be. However I think this is a general issue with all games. Before they are released we all imagine the game we would like them to be, which will generally be different for all us. When we are presented with something tangible, it inevitably comes up short for most people, because it isn't what we imagined. I agree Stellaris has taken things in a direction of micromanagement and I am just as disappointed there isn't more interaction between empires (and even internally). I think this is a huge missed opportunity for Stellaris. But I don't think the game is atrocious. It has a pretty smooth interface, a lot of interesting stories (at least until you memorize them all), and a pretty appearance. It is a pleasing experience, in its own way. It just isn't the game that most of us imagined, or hoped it would be. I agree somewhat. They do need to look outward and increase the interactions a player has with other empires. But I also think you're underselling it a bit. You can still do some really cool things with other empires and species most games can't do. 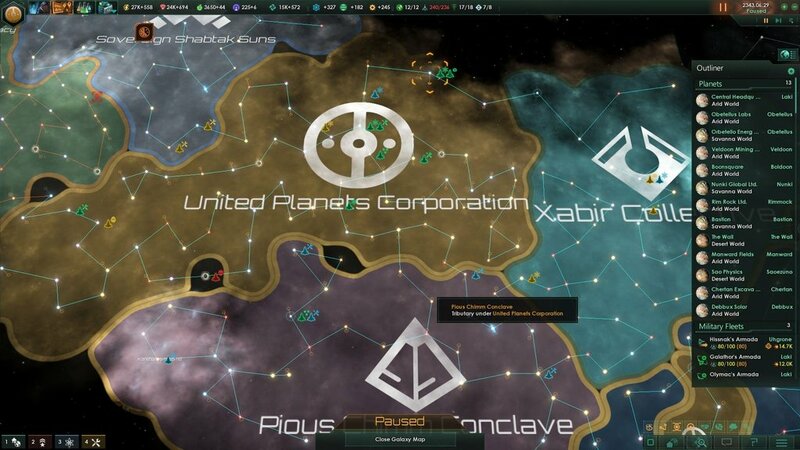 My last game (that worked) I ran geneticist slavers that conquered border mining planets in the mid game because I didn't have any, enslaved the local pops, and genetically modified them to be miners and stupid. And that story of galactic imperialism and enslavement was told purely through the game's systems. I agree they have shifted too far inwards, and also that current/new players enjoy building their ideal space civilizations, but there's still some storytelling that comes from the interactions with other empires. What's also worth noting is espionage and diplomacy are their next major expansion update, so this is basically exactly what you're asking for. Yes, to everything you said, it really is unfortunate. I am hopeful they do a Stellaris 2 that is a better version of the original or that someone makes a decent clone.